I've been especially excited about this month's Ratio Rally for a few reasons. For one, I have a kitchen again! We moved last month, and not just to a new house or a new city - I mean over 3000 miles. In a car. If you've ever done something like that, you know how topsy-turvy everything gets. And that's not even considering how details like "eating something other than cookies for dinner" seem to suddenly go to the very bottom of your priority list. A proper, sit-down meal seems like a luxury - doubly so when you're dealing with dietary restrictions. And blogging? Forgetaboutit. You can imagine, then, how excited I was to finally get back to cooking and baking and sharing new recipes. This was the first chance I got to work on a big "project" since leaving our old apartment several weeks ago, and I got to do it in a new kitchen...with windows! And a pantry! In a house! And did I mention the kitchen has windows?! OK, um, I'll calm down now. It's just that after living in stuffy apartments and dorms for the last 4 years, this is a Big Deal. On top of all that, I was excited for a second, completely separate reason - I have the pleasure of hosting this month's Rally! That also means I got to choose what we'd be making this month, which brings me to reason #3: doughnuts. Yeast-raised doughnuts. Cake doughnuts. Fritters. We covered them all this month! How long has it been since you've had a doughnut? A real, fried, melt-in-your-mouth sugary doughnut? It had been a long time for me, that's for sure. I remember occasionally visiting a certain small doughnut shop when I was much younger, peering into the glass case filled with row upon row of tantalizing treats, all frosted or glazed or covered in sprinkles or maybe even filled with jam. And I could pick out any one I wanted. Now, to put this in context - I didn't eat much "junk food" when I was a kid. There was no sugary cereal on the breakfast table; with the exception of some special occasions, snack foods and desserts were usually low-fat, sugar-free, or both (SnackWells, anyone?). Yet here I was, being encouraged to pick something that had been deep-fried and covered in sugar. A visit to the doughnut shop was a real treat. I always liked the simple ones best: powdered-sugar-covered doughnut holes; buttermilk bars; dense, cake-y chocolate doughnuts. They didn't need to be fancy; I just loved the way powdered sugar would melt ever-so-slightly into the golden, fried surface of the dough, forming a wafer-thin layer of crisp glaze as I bit into the springy cake. So simple, and so delicious. Yet sometimes simple things are the hardest to get right. You see, there was an extra challenge complicating this month's Ratio Rally: while the book that introduced many of us to the concept of baking by ratio has a reference ratio for fritters, there isn't one for doughnuts (and they are quite different). So many of us wanted to make doughnuts, though, that we set out to find a ratio! As with all ratio recipes which use eggs, start with the weight of your egg(s). To make a dozen doughnuts, I used 2 eggs, which had a combined weight of 100g - that is fairly standard. Since eggs and liquid are each 1 part, that means I need 100g liquid. Flour is 4 parts, so for me that was 400g. My flour blend was: 100g tapioca starch, 100g potato starch, 80g brown rice flour, 50g millet flour, 40g chickpea flour, 20g buckwheat flour, and 10g potato flour. You may use a different flour blend as long as you keep the same starch:whole-grain ratio (here, it is half starch and half whole-grain/whole-bean flour). If you are making a double batch or a half batch, remember to adjust the amounts of your other ingredients accordingly! The following amounts are based on 400g flour. Add the wet ingredients to the dry. 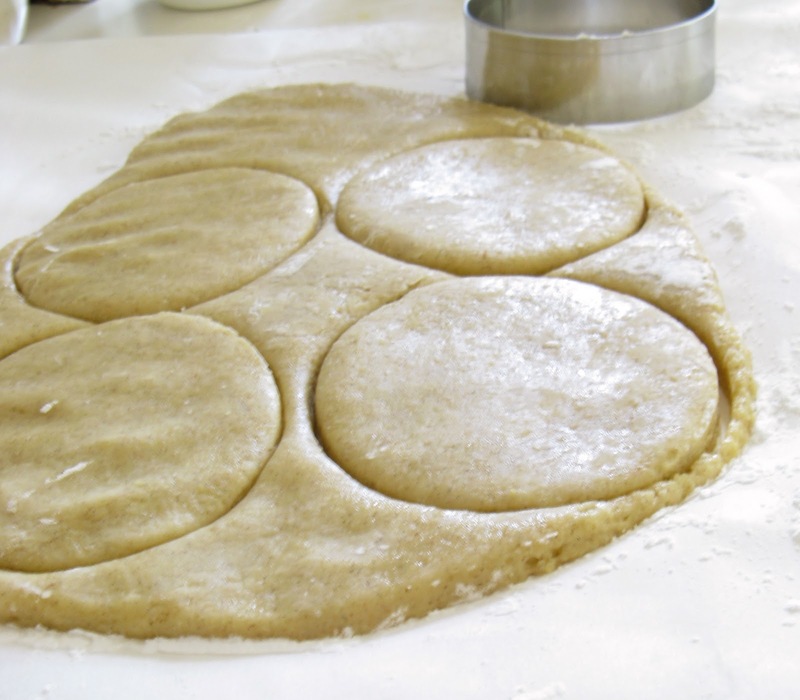 Mix well and knead until a soft, but not sticky, ball of dough forms. Let rest in bowl for about 20 minutes. All other ingredients and amounts stay the same. Proceed as directed for yeast doughnuts. Tip out the dough onto a surface lightly dusted with tapioca starch. Pat out the dough to a thickness of about half an inch and cut with a round biscuit cutter (or, if you are just making doughnut holes, roll dough into balls approximately 1 1/2 inches in diameter). You can make a traditional doughnut shape by simply poking a hole in the middle of each circle (see picture at top of the page). Repeat until all dough has been shaped. Heat palm shortening or high-temperature oil (e.g. 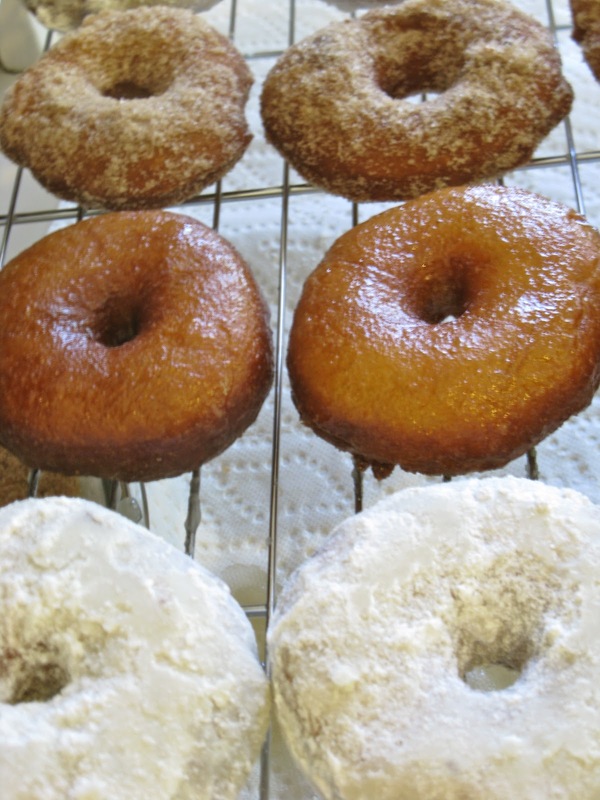 grapeseed, soybean, or canola oil) in a medium pot or deep-fryer over medium heat - the oil should be at least a couple of inches deep, so the doughnuts do not rest on the bottom of the pot. Keep a thermometer clipped to the pot at all times - oil can very easily overheat if you are not monitoring it closely, and it will retain that heat for a long time. When the oil reaches 375ºF/190ºC, you are ready to begin! Make sure you have a cooling rack ready. The one on the left has just been added - it sinks to the bottom. As it cooks, it soon floats to the top like the other two. Now all three are browning - time to flip them! Gently flip the doughnuts so they cook evenly on both sides. It doesn't take long, so watch them closely! When they are evenly brown, use the spatula or tongs to carefully transfer them to a cooling rack, one at a time. Make sure to let the oil come back up to the proper temperature before adding more doughnuts. Continue this process until they are all cooked. While they are still warm, roll them in powdered sugar or cinnamon-sugar, or dip them in a glaze. For the best texture and taste, wait about 3 hours before eating them. Be sure to check out the links below for all the delicious, creative doughnut and fritter posts in this month's Ratio Rally! What a fun roundup. I'm off to look at all the other doughnuts and fritters. Thanks for hosting this month's GF doughnut event. Yours turned out terrific. It was the perfect excuse for me to finally try making my own doughnuts. Thanks for hosting this month, Meg! My mouth is watering - what a great job you did! I can't wait to eat some! :) Thank you for hosting us this month! 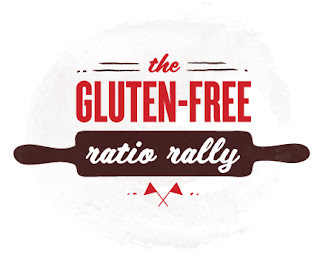 How do you get info about joining the Gluten-Free Ratio Rally? So excited to browse through all of this rally! 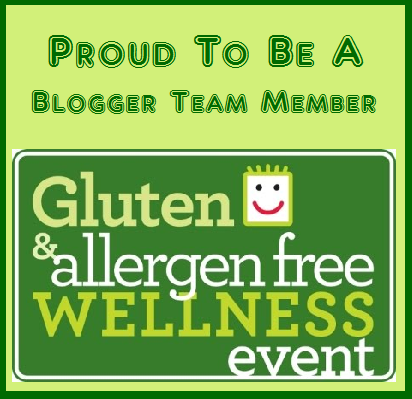 I'm going to write a little something over at www.52donuts.com about this, it's exciting to see so many gluten-free donuts.